Traders used to create their charts by hand. Today, however, many charting alternatives and options are available, including easy-to-use computer software and easily accessible Internet sites. You may, of course, still want to create charts by hand — at least for a little while. Making your own charts is easy, a great way to discover charting concepts, and an excellent way of getting a feel for the markets. A chart of stock prices shares characteristics with other charts with which you’re probably familiar. 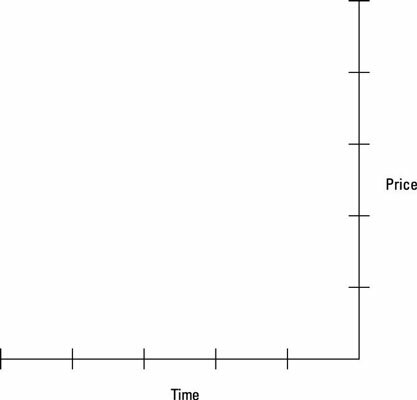 These kinds of charts typically are made up of two axes; the horizontal axis represents time, and the vertical axis represents price. One unusual feature of a stock chart is that its vertical axis, the price axis, usually is shown on the right. The current prices are shown on the right-hand side of the chart, and so are the newest trading signals. You always trade while those signals are on the right edge of a chart, so having the price axis closest to the most crucial part of the chart makes sense. Regardless of whether your chart is an intraday chart (showing fluctuations throughout a trading day) or a chart of daily or weekly prices, the format of the price bar is the same. Each bar represents the results for a single trading period. On a chart that provides daily information, for example, each bar represents the results for a single trading day. By convention, a daily bar chart shows trades for the standard New York Stock Exchange (NYSE) trading day — from 9:30 a.m. to 4:00 p.m. — but some charting packages include optional after-hours results as part of each daily bar. Likewise, some charting packages omit the opening prices on intraday charts. The opening price on an intraday chart (almost) always is the same as the closing price for the previous bar, so omitting it is of little consequence. However, omitting the opening price on daily, weekly, and monthly charts diminishes the usefulness of the chart, so avoid charts that don’t provide all four prices. In a single price bar, the full range of prices traded throughout the period is shown by the vertical bar. The opening price is shown as a small line on the left-hand side of the bar, and the closing price is shown by a similar line on the right-hand side of the bar. 1-minute bars: Each bar represents one minute of trading. 5-minute bars: Each bar represents five minutes of trading. 10-minute bars: Each bar represents ten minutes of trading. 15-minute bars: Each bar represents 15 minutes of trading. 60-minute bars: Each bar represents 60 minutes of trading. Daily bars: Each bar represents one full day of trading. Weekly bars: Each bar represents one week of trading. Monthly bars: Each bar represents one full month of trading. In addition to prices, bar charts often show the volume, or the number of shares traded during the given time period represented by each bar. On a daily chart, trading volume shows the total number of shares traded throughout the day. By convention, the volume is shown as a separate bar graph and usually is shown directly underneath the price chart. Volume is used as a confirming indicator. In other words, if a price bar shows bullish activity, that bullishness is confirmed by a higher-than-average trading volume. However, that bullish indication may diminish if trading volume is lower than average. Volume also is used to gauge institutional participation in a stock. Significant trading volume often signals that large institutional investors — mutual funds, pension funds, insurance companies, hedge funds, and others — are placing orders to buy or sell a stock. When prices rise and volume is strong, you usually can infer that institutions are accumulating positions in the stock. The reverse also is true. When prices fall and trading volume is high, large institutions may be liquidating positions, which is considered a bearish development. You can create a single price bar chart at StockCharts.com by clicking on the tab for Free Charts, entering the stock symbol of the company you want to view in the box labeled Create at SharpChart, and then clicking Go. When you get to the SharpChart page, change the Chart Attributes from Candlesticks to OHLC Bars (Open High Low Close) or HLC Bars (High Low Close), whichever is your preference. 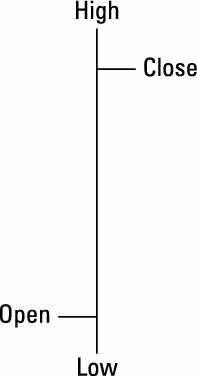 You also have the choice of a thin or thick line, which again is your preference. You can find Chart Attributes below the chart. You should also change the volume from Overlay to Separate. 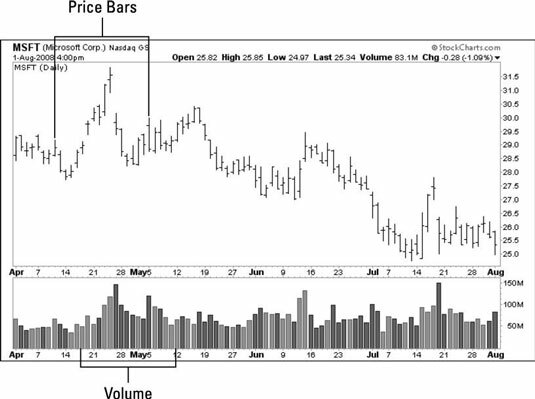 Displaying price and volume bars in color is common on charts. When using color, be sure to use contrasting colors so you can distinguish up days from down days. One prominent charting package, for example, defaults to green for up days and red for down days. A StockCharts.com defaults to black for up days and red for down. Most charting services enable you to configure colors to suit yourself.